September 2015. Pictured are (front row) Maria Long, Marta Byrska-Bishop, Nergiz Dogan; (back row) Jacob Wozniak, Cheryl Keller Capone, Ross, Belinda Giardine, Tao Yang. Lab reunion article in Genome Technology, June 2009, about training in the Hardison lab, entitled "Data is Truth" (by Matthew Dublin). Ross Hardison is the T. Ming Chu Professor of Biochemistry and Molecular Biology at the Penn State University. 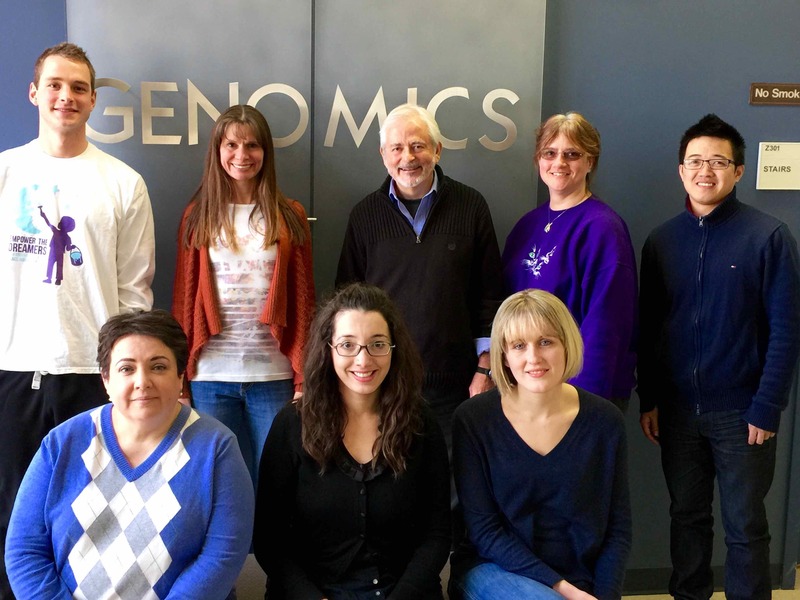 Ross and his co-workers (who are part of the Center for Comparative Genomics and Bioinformatics) measure transcriptome profiles and use epigenetic marks (such as transcription factor occupancy and histone modifications) and comparative genomics to predict gene regulatory modules. We test these predictions for function in the laboratory, and work to pull all this together into a more thorough understanding of global regulation during hematopoiesis. The techniques developed and utilized in this and associated labs should be applicable to a wide variety of regulated systems and organismal groups. For publications listed in PubMed, click here. Publications and citations compiled in Google Scholar. USEFUL DATASETS. These include DNA intervals that show conservation of transcription factor occupancy (work from the mouse ENCODE Consortium); these are highly enriched for enhancer activity. Links to many datasets and supplements to papers are provided. The presentation for Ross' keynote address at the Rat Genomics and Models meeting at Cold Spring Harbor Labs, Dec. 11, 2013, discussing translation of information about the genomics of gene regulation from rodent models to humans. You can download the PowerPoint presentation with a movie (about 100MB) or an alternative without the movie (25MB). Course material, comprised of lecture presentations (ppt), for a molecular genetics course based on Working with Molecular Genetics, 2002. Lecture presentations used in my online course in Genomics, BMMB 551. Much of our work was done in a long-standing collaboration with Dr. Webb Miller. Galaxy empowering transparent and sophisticated informatics and analyses for the broad community of life sciences. Use it and love it! Center for Comparative Genomics and Bioinformatics (CCGB). You can get a copy of a remembrance of our Aunt Anne ("Big Anne") and our grandparents (Hardison side) by their children and grandchildren here. This is a collective work by the family, edited and illustrated by Doug Shields, Jr. Copyrights are held by the family. This is the new, improved 2007 edition. You can get a picture of four generations of descendants of Hershel and Jane McKay Hardison, taken by Jane Jones at a reunion on June 29, 2008, here. The first edition (from about 2005) about the grandparents can be obtained here. You can get a copy of historical material, remembrances and photos from several generations of the Shields/Srygley/Scobey branches of the extended "Hardison" family, entitled "One Day at a Time", here. This came from Doug Shields, Jr.
A movie of the Penn State BlueBand marching in the Homecoming Parade, Oct 08, 2010.